Kids Music N' Motion offers class for preschool through grade 8 students. Our company has developed a curriculum that is developmentally appropriate for each age group, and also educational and fun! We have well-trained teachers supplied with the materials and skill-sets needed to give your students a well-rounded curriculum in music education. Kids Music N' Motion is a mobile music company that brings everything to your school. We work with all types of schools including preschools, private and public grade schools, liturgical and special needs groups, day-cares, and also parks and recreation facilities. We believe in teaching children with all learning styles - whether they are auditory, visual, or kinesthetic learners, they will learn in our classes! Since we are a mobile company, you choose the time and day you would like us to come and work with your students. 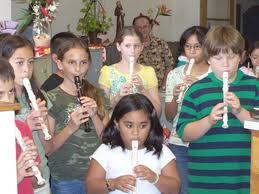 We offer after school enrichment programs, or classes designed to meet your school's music budget. We can offer weekly, semi-monthly, one time or even session classes. We have varying curriculum that is specialized for certain school bodies and grade levels. Elementary students can expect to learn and play every orchestral instrument before the year is out, while middle school students will be taught advanced music theory and even form a recorder ensemble or rock band. Classes can be adjusted to fit the school, and the curriculum can evolve to include specific areas of music based on the goals or interest level of the director - Band, Choir, Theater, or Dance. We donate 10% back to your school's music program! Please contact us Today with any interests in our music program! In the grade school program, students will be introduced to orchestra instruments, creative movement, singing, listening, and rhythm. Children are taught music theory, including how to read music to prepare them to play instruments well at a young age. Vocal techniques and different types of singing are taught, as well as different types of music from Baroque to Jazz. Rhythm will be taught through the use of percussion instruments such as drums, castanets, tone blocks, maracas and bells. This course will help develop awareness in the art of music and history. Group piano classes are offered with lessons in reading basic music and beginning music theory. Classes are taught in a group setting with up to 8 students. Each student is provided with their own keyboards to use for class in which KMNM brings to your site each week. Instruction material is brought for each class depending on the age and degree of skill for each group. This program is designed to be progressive offering a continuation to students advancing through to the next level of the book series. Each level takes approximately 15-20 weeks. Learn basic strumming and chords along with reading of music and learning the treble clef scale. Classes are taught in a group setting in which each child must provide their own Ukulele, which may be purchased directly from KMNM of from an outside source. We explore musical concepts that go along with the Ukulele instruction manuals which are age appropriate for the age group that the instructor in teaching. Each week students will be introduced to basic drum concepts such as technique, coordination independence on drums, drum tuning and drum rhythms. Music theory is also taught in these fun and hands on classes. Guitar and violin classes are offered to students possessing a foundation in music theory. Guitar classes will learn basic strumming, chord structure, and instrument maintenance (tuning). Guitar classes will focus on different genres of the instruments' repertoire and educate the students on advanced techniques to supply the child with all the skills they need to find and play music on their own. The violin classes will include the same curriculum for the guitar class teaching violin students proper technique, form, and bowing exercises for the budding violin player. All classes will continue to further their music education with advanced theory, scales, and music history. Choir classes are designed to instill confidence and proper technique in molding the students voice into a refined and well-tuned instrument. Basic techniques such as breath control, phrasing, head/chest voice, and style will be taught. The students will be introduced to several genres of choral music from Broadway to sacred aria. Help children to decide what instrument they would like to play in band enrichment in continuing session. This innovative and hands on class will introduce students to all the instruments that are in an orchestra. Students will receive hands on experience as they explore all instruments from woodwind, brass, percussion and brass instrument families. 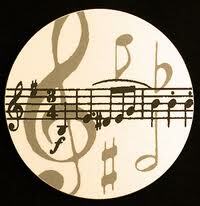 Music theory as well as the history of each instrument and music will be introduced in each class. All instruments and materials will be supplied by Kids Music N' Motion for this class. Parent information will be given out towards the end of the series for parents to help the children to make a decision if they would like to participate in the Kids Music N' Motion Band Program. Come join our rocking teachers as we form our own rock band and practice towards a performance at the end of the session. Instead of playing rock band on your game machines, come learn to play the real thing!!! 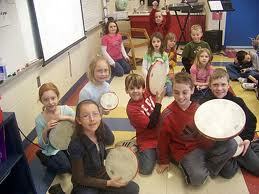 Each student will be introduced to Drumming, Guitar, Bass, Vocals and much more! No prior music experience is necessary. Musical theater classes are a blast. Students will be taught basic acting skills, set layout, and a little about the history of the theater. Kids can expect to learn cross-course knowledge such as singing techniques and about various instruments used in theater as well. A performance for family and friends will be held staging a few scenes from a major play or musical. The Youth Dance Program is for students to teach the basic elements of interpretive movement and dance. The class will focus on form educating the students on space and flow, relating the two both individually and as a group. The eight basic loco motor movements, musical rhythms, beat and timing, and stylized dancing of various musical forms will be taught in the class. The students will learn about a wide variety of cultural dancing from throughout the ages and even some different styles from closer to home such as hip hop and tap. This is an introduction for children to be introduced to instruments from all around the world. A variety of string, percussion, brass and woodwind instruments from all around the world are introduced and then children are allowed to try the instruments. An exciting class for the education of the world music for children of all ages. Each week a different continent will be introduced to children through instruments, songs and dance-movement. Children will have fun with instruments from each continent (no class on Antarctica) as they interact with instruments and other musical props as they discover far away lands and their music cultures. Each week children are introduced to famous composers as we travel through time with music. Classes include a multitude of musical instruments as well as movement and singing. Each week we introduce a new composer or Jazz artists along with many hands on activities. Each week children will join the fun with instruments, movement and more. Come join the fun as we go on a "Music adventure" each day. Kids Music N' Motion has wonderful Music Summer Camps for children ages 2.5-7. Each day of the week is a musical experience.Cowboys, Rock N' Roll, A Day at the Circus, Pirates Day, Mardis Gras, Around the World, African Jungle, Cinco de Mayo, Polar Bears/Penguins, Summer Fun/Beach Day, Hawaiian Luau. Each day children will be introduced to many instruments from around the world, singing, art projects, musical games, movement, music theory, making their own music CD and much more. We will provide everything else. Activities are age appropriate and designed to teach children to enjoy music in many different ways. This is a very "hands- on" camp where children will do wonderful activities each day. Come join the fun as we have our own "Idol Performance" and fun music activities for an entire week. Learn Voice Techniques and games. Learn about instruments and how to play along with songs. Play piano, drumming and guitar games. Pop, rock-n-roll, Broadway, rap and traditional music will be taught. Music Crafts. Songwriting techniques, role-playing and performing techniques, dancing and lots more!! There is something for everyone in this innovative and fun camp!! Learn theatre and production skills in this fun 1-week musical production. Campers will learn vocal and performance techniques as a practice a variety of small-scale musical songs. A performance will be given on Friday for Family and Friends of the campers. Come join our rocking teachers as we form our own rock band for a week of musical fun. Instead of playing rock band on your game machines, children learn to play the real thing. Each camper will be introduced to Drumming, Guitar, Bass Vocals, Percussion and much more. No Prior Music experience is necessary. Young Dancers will learn jazz, kick, hip-hop, tap and more. Styles such as prop, lyrical ballet and pom will be included in this fun week. Focus on technique, learning and FUN. Dancers will learn new ideas, tips and skills to get them to the next level. Cheerleading Camps support the team by preparing young athletes for competition. Proper hand and body movements and jumping techniques are taught during the week with a choreographed performance n Friday for family and friends. Have your school join us for a riveting journey through the History of Music! From the percussive drums of cave men to the electronic grooves of today, students will be introduced to a variety of popular musical genres spanning over time and through different cultures. After the assembly, we invite all students to visit our Musical Petting Zoo where they will have a change to touch and experience many of the instruments used in the assembly first hand. Our instructors will be on hand to speak about the instruments.